Gathering the fruit of the earth is possibly the oldest instinct mankind has. Native Americans sang songs to corn and beans to encourage them to grow. The Mayans built gardens in the water, and the Middle Easteners raised crops in the desert. Francis Bacon said, “God first made a garden.” William Shakespeare said, “Adam was a gardener.”Gardening is in our blood. So it should be no surprise to us that gardening is the number one hobby in the United States—whether on fertile soil or a rooftop, greenhouse, or patio—if people can’t find a vacant spot of soil, they import one. Gardening is more than an ancient survival skill, it is good for us and suitable for any age. 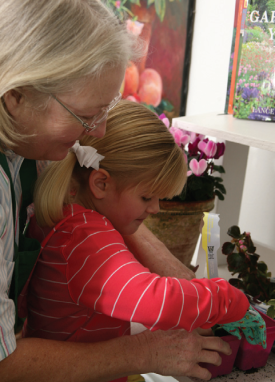 According to the NGA, many teachers with school gardens report that children behave better after gardening, and their scholastic achievement improves. This leads to more self-confidence and a better attitude toward learning. 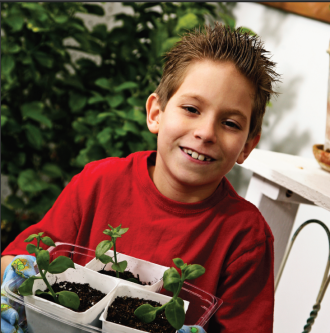 With so much emphasis on Going Green, teaching children how to grow their own food is one of the best things we can do. Listed below are two websites that offer parents lots of ideas for year-around projects, most of which are a lot cheaper and certainly healthier than video games. Check these online resources www.kidsgardening.com and www.gardeningwithkids.org. Gardening with children offers so much versatility that when the weather turned cold and blustery for our photo-shoot, it didn’t matter. Instead of dropping little seeds along a line of twine on a sunny day, we took advantage of Gail Gilbert’s charming, old-world potting shed and propagated new plants from cuttings. Jami and Jan put soil in a container. Novice junior gardeners, Anthony and Jami, and Master Gardeners Jan Hickerson and Henri DeWit. DeWit, who has farmed in Rhodesia and South Africa as well as Texas, and Hickerson, a native Texas with roots in cotton farming, gave patient instructions to the children. First, they put good soil into containers and moistened it to just the right amount—like a wrung-out sponge. Then they cut the sprigs of begonias, apple vine, or ornamental sweet potatoes just below a bud and stripped off unnecessary leaves. Anthony and Jamie poked holes in the soil and carefully placed the pieces of plants inside and tamped the soil around them. With instructions to water from the bottom, both children took their cuttings home to grow into new plants. Under the assault of national chains, big box retailers, and Internet discounters, local bookshops in many parts of the country are closing their doors and saying goodbye to devoted customers. In Denison and Sherman, three local bookstores, Epiphanies, Ex Libris, and The Book Rack have bucked the trend and kept their doors open, and Texoma bibliophiles are glad for it.